It’s springtime! Change is drifting through the air with the sunshine and birdsong, so why not let a little of the good stuff into your home? A spring makeover is much easier than you think, so read on for a few quick and simple (and cheap!) suggestions to give your living space a fresh new feel. Now that your brain has started to thaw, it’s time we put it to good use. Daylight savings has arrived, so pick up some fairy lights or string lanterns (super cheap!) and get decorating on your balcony or verandah. All that’s left to do now is sit back with a cold bevvy and let the balmy evening roll in. It couldn’t be a better time to transform your bedroom wall into a glorious springtime mural. If you’re tired of staring at the same old walls all day, it’s time to freshen them up. Paint is yesterday’s news, so why not indulge in a spot of DIY wallpapering? The choice of colours and patterns is endless, and it’s a surprisingly satisfying way to spend a day or two. Don’t have the time for a full wallpapering session? Try adding fun decals instead. 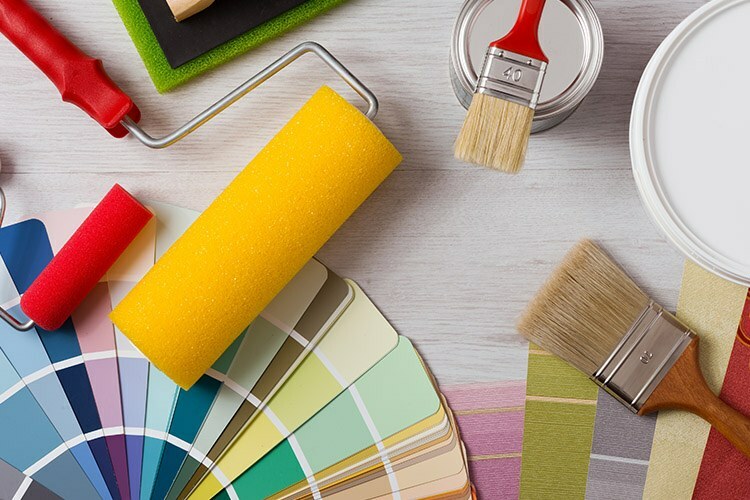 And if decorating just isn’t your forte, have a chat to a pro near you. You know what the best thing about furniture is? Messing around with it! Tinkering with the layout of your sofas, tables, cabinets and drawers is an awesome way to find space you never knew you had, and we all know a spot of fung shui can do wonders for the soul. If you’ve got an old cabinet that’s crying out for a bit of love, a good sanding and staining will do the trick. Get some friends over, pour a few drinks and start moving stuff around to see what looks good. You might wake up with a bit of a sore back (and/or head), but it’ll totally be worth it for your killer new set-up. If you haven’t noticed, flowers are actually fairly integral to this whole ‘spring’ thing. They’re bright, fragrant and instantly uplifting, so feel free to go a bit nuts when selecting your spring bouquets. This season, think sweetpeas, hyacinths and peonies in pastel shades for a gorgeous watercolour effect. Arrange them by scent, colour or style. Stick them in mugs, milk bottles and marmalade jars, and get extra points for growing them yourself! Head to a flower market for the freshest blooms or stop by at a local nursery if you’re willing to give your green thumbs a workout. If you’re living in a terrace or older-style house, we’ve got a secret to let you in on: Your not-so-hot carpet could be concealing gems underneath. And by gems, we mean wooden floorboards. If that’s the case, you might want to consider ditching the whole thing and letting the timber beneath emerge. You’ll need to clean and wax the floorboards, of course, but it’s definitely worth the elbow grease. After all, what better way to symbolise the dawn of spring than by shedding a rough winter coat? It’s just too perfect. Remember, if your wooden floor needs some extra work to get it looking its best, it’s always best to call in the pros to handle the cleaning. We’ve got a few go-tos. Don’t forget to browse our listings for more trusted businesses in your area!